This Bibliography was taken from a handout provided at my lecture about Eleonora of Toledo (Eleonora de Toledo) at the Society for Creative Anachronism’s (SCA) Pennsic War, as well as newly available sources. Arnold, Janet: Patterns of Fashion: The Cut and Construction of Clothes for Men and Women 1560-1620. New York: Drama Books. 1985. ________ Preliminary Investigation into the Medici Grave Clothes. Il Costume nell’ etas’ del Rinascimento. (No publisher available) Florence: 1988. ________ A personal letter to Monica E. Spence, 1992. Arnold, Janet, Roberta Orsi Landini, et al: Moda alla corte dei Medici: gli abiti restaurati di Cosimo, Eleonora e don Garzia, Firenze: Centro Di della Edifimi slr. 1993. Baccheschi, Edi: L’Opera Completa del Bronzino. Milan: Rizzoli. 1973. Barolsky, Paul: Infinite Jest: Wit and Humor in Italian Renaissance Art. Columbia (Missouri): University of Missouri Press. 1978. Brion, Marcel: The Medici, A Great Florentine Family. New York: Crown Publishers Inc. 1969. Bruckner, Gene: Florence: The Golden Age – 1138-1737. Berkley: University of California Press. 1998. Calloway, Steven and Jones, Steven: Royal Style: Five Centuries of Influence and Fashion. Boston: Little Brown and Company. 1991. Campbell, Lorne: Renaissance Portraits. New Haven: Yale University Press. 1990. Caneva, Caterina, et al. : The Uffizi Guide to the Collections and Catalogue of All Paintings. Florence: Becocci/Scala. 1986. Cecci, Alessandro: Bronzino. New York: Riverside Book Company. 1996. Cellini, Benvenuto: The Autobiography of Benvenuto Cellini. Edited and abridged by Charles Hope and Alessandro Nova from the Translation by J.A. Symonds. Oxford: Phaidon Press. 1983. Cochrane, Eric: Florence in the Forgotten Centuries 1527-1800. Chicago: University of Chicago Press. 1973. Cleugh, James: The Medici: A Tale of Fifteen Generations. New York: Dorset Press. 1975. Cox-Rearick, Janet: Bronzino’s Chapel of Eleonora in the Palazzo Vecchio. Berkley: University of California Press. 1993. _________Bronzino’s Young Woman with Her Little Boy. Studies in the History of Art Volume #12. Washington: National Gallery of Art. 1982. _________Dynasty and Destiny in Medici Art: Pontormo, Leo and the Two Cosimos. Princeton: Princeton University Press. 1984. Currie, Elizabeth: Fashion and Masculinity in Renaissance Florence. London: Bloomsbury. 2016. Davenport, Millia: The Book of Costume. New York: Crown Publishers. 1948. Feinberg, Larry J.: From Studio to Studiolo: Florentine Draftsmanship Under the First Medici Grand Dukes. Seattle: Marquand Books. 1991. Ferrai, Luigi A.: Cosimo de Medici. (No publisher given) Bologna: 1882. Fox, Linda R.: Portraits of Eleonora of Toledo (Part I) Costumers Newsletter (Seams Like Old Times. Volume #2. Bloomington (Indiana): 1983. _______Portraits of Eleonora of Toledo (Part II) Costumers Newsletter (Seams Like Old Times) Volume #5. Bloomington (Indiana) 1983. Gregori, Mina: Paintings in the Uffizi and Pitti Galleries. Boston: Little Brown and Company. 1994. Hibbert, Christopher: Florence the Biography of a City. New York: W.W. Norton and Co. Inc. 1993. _______The House of Medici: Its Rise and Fall. New York: Morrow Quill Paperbacks. 1980. Joyce, Kristin and Addison Shellei: Pearls: Ornament and Obsession. New York: Simon & Schuster. 1993. Landini, Roberta and Bruna Niccoli, Moda a Firenze: 1540-1580, Lo stile di Eleonora di Toledo e la sua influenza. Firenze: Edizioni Polistampa: 2005. 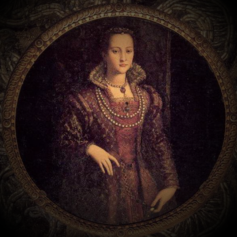 Landini, Roberta, Moda a Firenze: 1540-1580, Lo stile di Cosimo I de’ Medici’s style/ Lo stile di Cosimo I de’Medici. Firenze, Edizioni Polistampa: 2011. Lees, Dorothy N. (trans. ): Florence. Novara: Instituto Geografico de Agostini. 1955. _______Painting at Court: the Wrightman Lectures. NY: New York University Press. 1971. Langedijk, Karla: The Portraits of the Medici (2 vol.). Florence: Studio per Edizioni Scelte. 1981. Luchinat, Christina A. (ed. ): Treasures of Florence: the Medici Collection 1400- 1700. New York: Prestel. 1997. Marinis, Fabrizio de’ (ed. ): Velvet. New York: Idea Books. 1994. 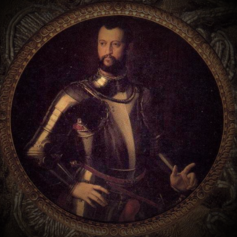 Massinelli, Anna Maria and Tuera, Filipo: Treasures of the Medici. New York: Vendome Press. 1992. Micheletti, Emma: Le Donna dei Medici. Florence: Sansoni. 1983. Minor, Andrew C. and Mitchell, Bonner: A Renaissance Entertainment: Festivities for the Marriage of Cosimo I, Duke of Florence in 1539. Columbia (Missouri): University of Missouri Press. 1968. Regoli, Gigetta, et al: Uffizi/Florence: Great Museums of the World. New York: Newsweek. 1968. Rud, Einer: Vasari’s Life and Lives. Princeton: D. Van Nostrand Co. Inc. 1963. Ruskin, Ariane: Art of the High Renaissance. New York: McGraw Hill Book Company. 1968. Strehl, Melinda: Knitting Eleonora of Toledo’s Stockings. Tournaments Illuminated, Issue #126, Spring. Milpitas (California): Society for Creative Anachronism. 1998. Tinagli, Paola: Women in Italian Renaissance Art: Gender, Representation, Identity. New York: St. Martin’s Press. 1997. Vasari, Giorgio: Lives of the Artists (2 vol.). Tr. by George Bull. New York: Viking Penguin Press. 1987. Young, G.F.: The Medici (2 vol.). New York: E.P. Dutton and Company. 1920.